Folks wait for the fireworks show to begin during last year’s festival. Higashi Village is busy making sure everything is ready for its annual summer festival taking place this Saturday, Aug. 6. 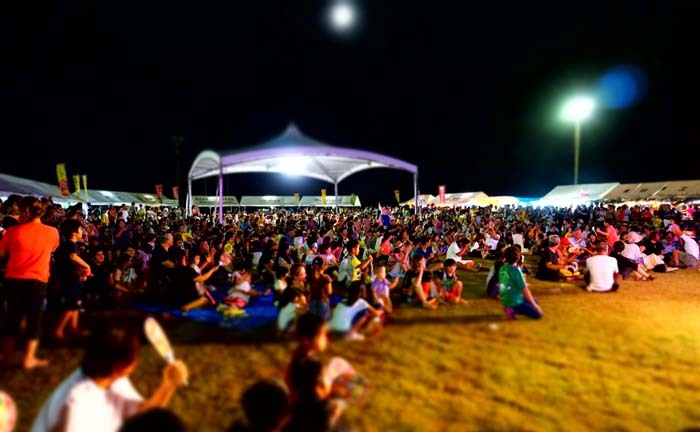 Higashi is an active community of some 2,000 people on the north-eastern coast of the island, and the festival is special because it’s a combination of an industry fair and traditional Okinawan community summer festival. The opening ceremony is held at 10:00 and the first 100 people attending will walk away with a pineapple giveaway. The festival features many events that require participation of the audience, such as a rock-scissors-paper competition at 11:00 and 15:00 in front of the main stage. Everybody can join and the winners get a gift courtesy of JA (Japan Agricultural Cooperative). Free workshops, such as bingata coloring, pineapple jam cooking and making sandals from used car tires all help to keep visitors busy. The bingata coloring workshop starts at 11:30 and has space for the first 20 persons. Pineapple jam cooking also accepts 20 participants and starts at 13:30, and the secrets of sandal making are revealed starting at 14:00 with the first 10 people being able to try their own hand in the craft. Others can naturally watch. A fish auction in front of the main stake kicks off at 16:00, and is free for everybody to join. Live music and dance performances are on stage throughout the whole day. Three boat tours on the nearby Fukuchi Dam are available for 40 participants at a time. The boat cruises the dam about 50 minutes and the tour costs ¥500, but is free for children under 6. Departure times are 12:00, 14:00, and 16:00. To take part go to a reception desk at the festival grounds 30 minutes before the scheduled boating time. Transportation between the festival venue and dam is provided including in the fee. 1500 fireworks at 20:45 end the festival.